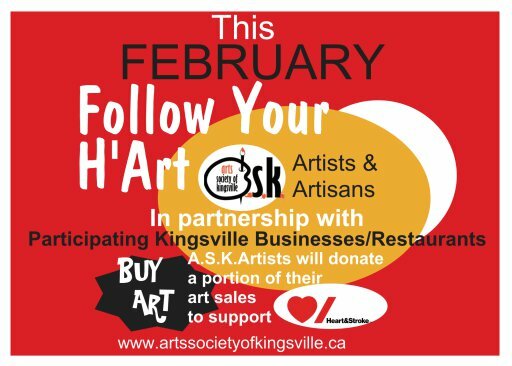 Arts Society of Kingsville’s (A.S.K. ), which includes many artists/artisans from Windsor, Essex County and beyond, is hosting its third annual Follow Your H’art is an innovative fundraiser for Heart&Stroke Foundation. During February A.S.K. artists are partnering with more than 30 local businesses and restaurants to display and sell art, a portion of the sales going to Heart&Stroke. This event is also dedicated in memoriam to our event founder, the inspirational and dedicated Joan Cotte. The public is invited to support Joan’s vision, heart and stroke research and local artists and businesses by purchasing both sponsor products/services, as well as A.S.K. art. Look for the large red posters in shop windows all month. New this year is the Sat., Feb. 16 Art Crawl, 2-4pm (4-7pm for restaurants who open later), where artists will greet the public personally with treats and demonstrate their art at participating businesses. There is no charge for this event.